Kelly, 51, a mother of five who lives in the Midwest, wants to get back into the workforce after a 20-year absence. Her family isn't in financial trouble -- not yet, anyway -- because she and her spouse have studiously avoided debt, even paying off their mortgage, and they have some cash-producing investments. But her husband is struggling to find a job. Kelly (who asked that we not use her last name) faces an enormous challenge. 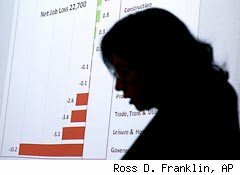 Friday's employment report showed the economy failed to add jobs in August for the first time in a year. The official unemployment rate is 9.1% percent, but that rises to 16.2% when including people who have stopped looking for work and those settling for part-time jobs. Overall, the long-term unemployed -- those who have been out of work for 27 weeks or more -- represent nearly 43% of the jobless. Among women age 45 to 64, the number of long-term unemployed rose 6% year-over-year in August, to 1,046,000. As Kelly contemplates the future, she has the nagging feeling that she's looking down the economic ladder, on the verge of a dizzying slide. After all, it was a long way up. Kelly grew up on the East Coast, one of three daughters of a clerical worker and a fireman who also worked a second job. "We didn't do anything special, but we had a nice house and I was quite content. I never felt like I didn't have things," she says. Kelly put herself through college and landed in a career she loved, negotiating contracts at two different aerospace firms. Her husband had it tougher: He started working at age 12 to support his mother and nine siblings after his father left the family. In the 1980s, he launched a mortgage business where Kelly worked part-time, and sold it a decade later for a substantial profit. "He was working himself to death," Kelly says, and she was thrilled when he finally took some time off. "He wanted to be more involved with his children. We were able to invest our money and live a modest but nice life." The couple plowed their windfall into rental homes, the stock market and other investments. Some did well while others tanked. They set aside savings for the kids' college and gave literally hundreds of thousands of dollars to help out strapped family members. As the housing market heated up in the mid-2000s, her husband did some construction management work and started a small contracting firm. A few years ago the couple realized their investments wouldn't sustain them long-term, so Kelly's husband went back to school and earned an MBA. "We were hoping this would make him more marketable," says Kelly. "He has an amazing financial mind, but could not find a job." Friends from business school have asked him to launch a start-up with them, but "he's afraid to invest in something because if it doesn't work, we'll be in trouble," says Kelly. Kelly has two children in college, a high schooler, an elementary student, and one in graduate school. Her college kids work summers to help pay for textbooks and living expenses, and the oldest is footing the bill for her own master's degree. Uncertain about the future, the couple has shunned vacations, restaurants and new clothes, and is focusing on simple pleasures -- family dinners, bike rides, attending the kids' sporting events and barbecues with friends. "I'm lucky with my family and my health and that's huge in my life," says Kelly. "But I still want to be able to really contribute financially." A 2009 survey by the Center for Work-Life Policy found that 73% percent of women trying to return to the workforce after a voluntary absence have trouble finding a job. And Kelly's situation mirrors another growing trend: Women in 2009 were 28% more likely to have a nonworking spouse than they were five years earlier. I suggested Kelly talk with her husband about her taking an active role in building his small contracting business, so he could put more energy into his job search. It would provide an opportunity to refresh her office technology skills, tap her community network and flex her negotiating muscles, while building up new experience for her resume. "Companies are extremely enthusiastic about the skills entrepreneurs have to offer," says Vivian Steir Rabin, co-author of Back on the Career Track: a Guide for Stay-at-Home Moms Who Want to Return to Work. Rabin, a Harvard Business School graduate, is co-founder of iRelaunch, a firm that designs career reentry programs for employers and individuals. Also a mom of five, Rabin re-entered the workforce after a seven-year break. If Kelly prefers not to get involved in the family business, she should get focused, says Rabin: What skills did she enjoy using on the job? Is she passionate about a certain industry? Is she open to commuting or does she need to limit her search to local firms? "You have to have a target -- people can't help you unless you are more specific about what you want," says Rabin. While she refines her target, Kelly can put up a profile on LinkedIn, listing educational institutions and former positions. That will allow her to join alumni groups for those organizations, connecting her with potential contacts and events. That exercise can also serve as the basis for her new resume, which should include the part-time work at her husband's company and substantive volunteer work. Describe volunteer accomplishments in business terms, i.e., "Managed 50 volunteers in raising $40,000 for a school fundraiser, a 20% increase over the previous year's event." LinkedIn can also be used to find current and former employees at Kelly's target companies, and if they're on Twitter, she should follow their activities. That could give her a clearer view of various firms' priorities and challenges. She can contact those folks and ask to meet for coffee for 20 minutes to learn more about growth areas of the company. Practice interviews well before you go to a real one, says Rabin: "This is where people who have been out of work a long time don't do well -- they are very defensive about the fact that they've been out and should not be." Kelly shouldn't dwell on the gap in her resume, but talk about her work accomplishments as though they happened yesterday. Another angle: Ask to consult on a specific project for a firm, or offer to do a non-binding trial stint of three to six months. "Companies are leery of taking people on a permanent full-time basis. Make it easy for the company to test you out without having to commit," says Rabin. Although Kelly worries about not being as available for those of her kids still at home, she's anxious to get back to an office. "I wanted to be there for them as much as I was for the others, but things change," she says. "I'm not the greatest homemaker anyway," she adds with a laugh. "I hate cooking and all that kind of stuff, so I'm better off working."